In Western music, motet is a word that is applied to a number of highly varied choral musical compositions. The name comes either from the Latin movere, ("to move") or a Latinized version of Old French mot, "word" or "verbal utterance." The Medieval Latin for "motet" is "motectum." If from the Latin, the name describes the movement of the different voices against one another. "...a piece of music in several parts with words" is as precise a definition of the motet as will serve from the thirteenth to the late sixteenth century and beyond. This is actually very close to one of the earliest descriptions we have, that of the late thirteenth-century theorist Johannes de Grocheio." Grocheio was also one of the first scholars to define a motet. He expressed the belief that the motet was "not intended for the vulgar who do not understand its finer points and derive no pleasure from hearing it: it is meant for educated people and those who look for refinement in art." The earliest motets arose in the thirteenth century, out of the organum tradition exemplified in the Notre Dame school of Léonin and Pérotin. The motet arose from discant (clausula) sections, usually strophic interludes, in a longer sequence of organum, to which upper voices were added. Usually the discant represented a strophic poetic sequence in Latin which was sung as a discant over a cantus firmus, which typically was a Gregorian chant fragment with different words from the discant. The motet took a definite rhythm from the words of the verse, and as such appeared as a brief rhythmic interlude in the middle of the longer, more chant-like organum. The practice of discant over a cantus firmus marked the beginnings of counterpoint in Western music. From these first motets arose a medieval music tradition of secular motets. These were two or three part compositions in which several different texts, sometimes in different vernacular languages, were sung simultaneously over a Latin cantus firmus that once again was usually adapted from a passage of Gregorian chant. It is suspected that, for the sake of intelligibility, in performance the cantus firmus and one or another of the vocal lines were performed on instruments. Increasingly in the fourteenth and fifteenth centuries, motets tended to be isorhythmic; that is, they employed repeated rhythmic patterns in all voices—not just the cantus firmus—which did not necessarily coincide with repeating melodic patterns. Philippe de Vitry was one of the earliest composers to use this technique, and his work evidently had an influence on that of Guillaume de Machaut, one of the most famous named composers of late medieval motets. The name of the motet was preserved in the transition from medieval to Renaissance music, but the character of the composition was entirely changed. While it grew out of the medieval isorhythmic motet, the Renaissance composers of the motet generally abandoned the use of a repeated figure as a cantus firmus. Guillaume Dufay was a transitional figure; he wrote one of the last motets in the medieval, isorhythmic style, the Nuper rosarum flores which premiered in 1436 and was written to commemorate the completion of Filippo Brunelleschi's dome in the cathedral of Florence. During this time, however, the use of cantus firmi in works such as the parody mass tended to stretch the cantus firmus out to great lengths compared to the multivoice descant above it; this tended to obscure the rhythm supplied by the cantus firmus that is apparent in the medieval isorhythmic motet. The cascading, passing chords created by the interplay between multiple voices, and the absence of a strong or obvious beat, are the features that distinguish medieval and renaissance vocal styles. Instead, the Renaissance motet is a short polyphonic musical setting, sometimes in imitative counterpoint, for chorus, of a Latin text, usually sacred, not specifically connected to the liturgy of a given day, and therefore suitable for use in any service. The texts of antiphons were frequently used as motet texts. This is the sort of composition that is most familiarly named by the name of "motet," and the Renaissance period marked the flowering of the form. In essence, these motets were sacred madrigals. The relationship between the two forms is most obvious in the composers who concentrated on sacred music, especially Giovanni Palestrina, whose "motets" setting texts from the Song of Solomon or Canticum Canticorum, the Biblical Song of Solomon, are among the most lush and madrigal-like of Palestrina's compositions, while his "madrigals" that set poems of Petrarch in praise of the Virgin Mary would not be out of place in church. The language of the text was the decisive feature: if it is Latin, it is a motet; if the vernacular, a madrigal. Religious compositions in vernacular languages were often called madrigale spirituale or madrigali spirituali (spiritual madrigals). Like most madrigals, Renaissance motets developed in episodic format, with separate phrases of the source text being given independent melodic treatment and contrapuntal development; contrapuntal passages often alternate with monody. In the latter part of the sixteenth century, Giovanni Gabrieli and other composers developed a new style, the polychoral motet, in which two or more choirs of singers (or instruments) alternated. This style of motet was sometimes called the Venetian motet to distinguish it from the Netherlands or Flemish motet written elsewhere. In Germany, too, pieces called motets were written in the new musical languages of the Baroque. Heinrich Schütz wrote many motets in a series of publications called Symphoniae sacrae, some in Latin and some in German. There is also a piece of a cantata that is classified as a motet. Later eighteenth-century composers wrote few motets, although Mozart's well-known 'Ave verum corpus' is in this genre. In the nineteenth century, German composers continued to write motets occasionally, notably Johannes Brahms (in German) and Anton Bruckner (in Latin). French composers of motets included Camille Saint-Saëns and César Franck. Similar compositions in the English language are called anthems, but some later English composers, such as Charles Villiers Stanford, wrote motets in Latin. 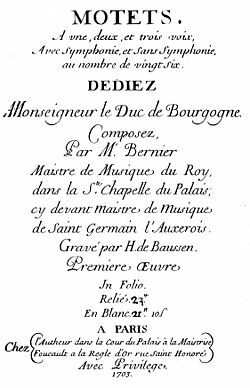 The majority of these compositions are a cappella, but some are accompanied by organ. In the twentieth century, composers of motets have been conscious imitators of earlier styles, such as Ralph Vaughan Williams, Hugo Distler, Ernst Krenek, and Giorgio Pacchioni. ↑ Margaret Bent, "The late-medieval motet," in Companion to Medieval & Renaissance Music (New York: Oxford University Press, 1997, ISBN 0198165404). ↑ The Applied History Research Group, End of Europe’s Middle Ages: The Development of the Motet, University of Calgary. Retrieved July 5, 2007. ↑ Blanche Gangwere, Music History during the Renaissance Period, 1520–1550 (Westport, CT: Praeger Publishers, 2004, ISBN 0313292485), p. 451. The Applied History Research Group. End of Europe’s Middle Ages: The Development of the Motet. University of Calgary. Retrieved July 5, 2007. This page was last modified on 2 April 2008, at 12:40.